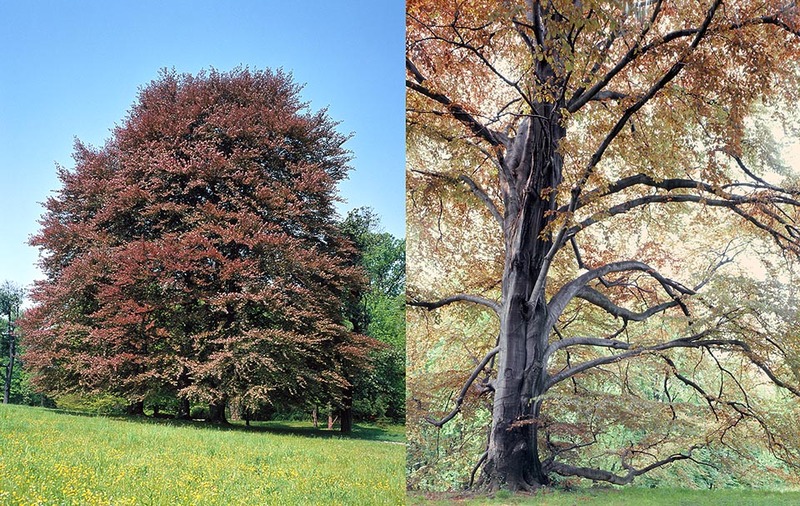 The Common beech (Fagus sylvatica L.) belongs to the botanical family of the Fagaceae and toghether with the chestnut and the oak represents one of the forest species of major interest in Italy. The name of the genus Fagus comes from the Greek language and means “I eat”; whilst the specific epithet sylvatica, is referred to the natural environment that implies this species, the “silva”, that is the wood. 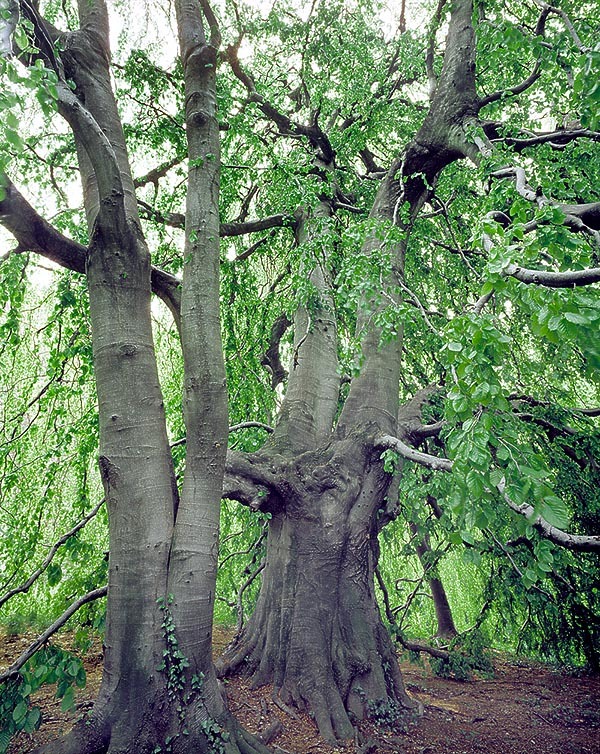 The Common beech is a first-magnitude tree, that may reach the 40 m of height; however, it is not too very long-lived, as it, at most, can reach the 200-300 years of age. It is a tree with a conical-globose posture, a very ramified crown and a particularly dense vegetation. The common beech is an arboreal species amply diffused in Europe from southern Scandinavia up to Italy, getting its natural diffusion also in the Mediterranean basin and even in Sicily (Etna and Madonie) and in some sites in Greece. In northern Italy it is amply present on the slopes of the Alps and of the Prealps and along most of the Apennines. 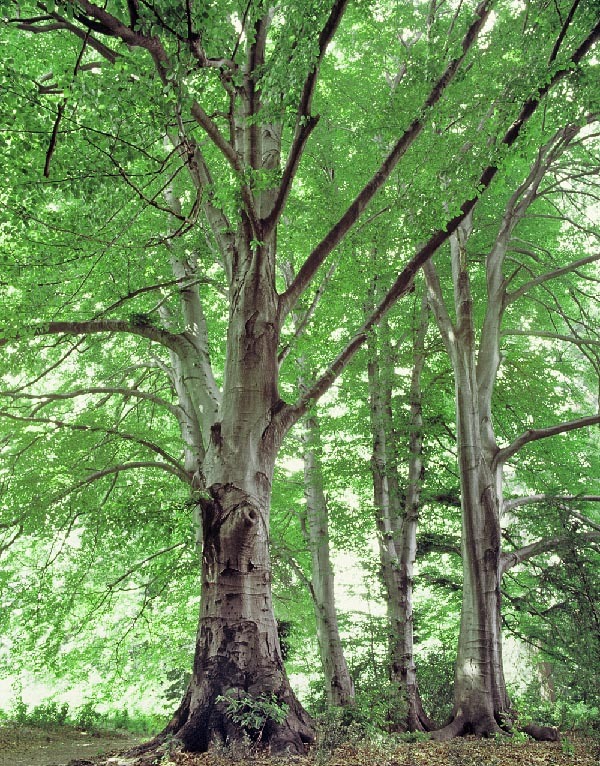 The common beech often forms extended monospecific woods, called beechwoods, moreover being able to get in association with other arboreal species such as the Silver fir (Abies alba), the Sycamore (Acer pseudoplatanus), the Ash (Fraxinus excelsior), the Linden (Tilia platyphyllos), etc. The common beech finds favorable growth conditions in the Italian mountain environment where the climate is cool and misty, with frequent summer rainfalls, between the 700 and the 1600 (up to 2.000 m) of altitude above the sea level. The bark is pale grey, often colonized by lichens, perfectly smooth in the young specimens, being able over time to originate cracks and fissures. Singular characteristic of the common beech is the capacity to form globose protuberances, called spheroblasts. Initially, the rooting apparatus is tapering, then it tends to expand mainly in an horizontal direction. The leaves, are simple, alternate, deciduous, of elliptical shape, of dark green colour in the upper page and paler in the lower one. In autumn, they can get showy colours going from the yellow-orange to the redbrown. The common beech is a monoecious plants able to produce male and female flowers on the same plant but in different positions. The male flowers are united in round and drooping catkins, with long petiole. The female inflorescence is erect and with short peduncle. The blooming occurs at the same time as the foliation and takes place during the month of May. 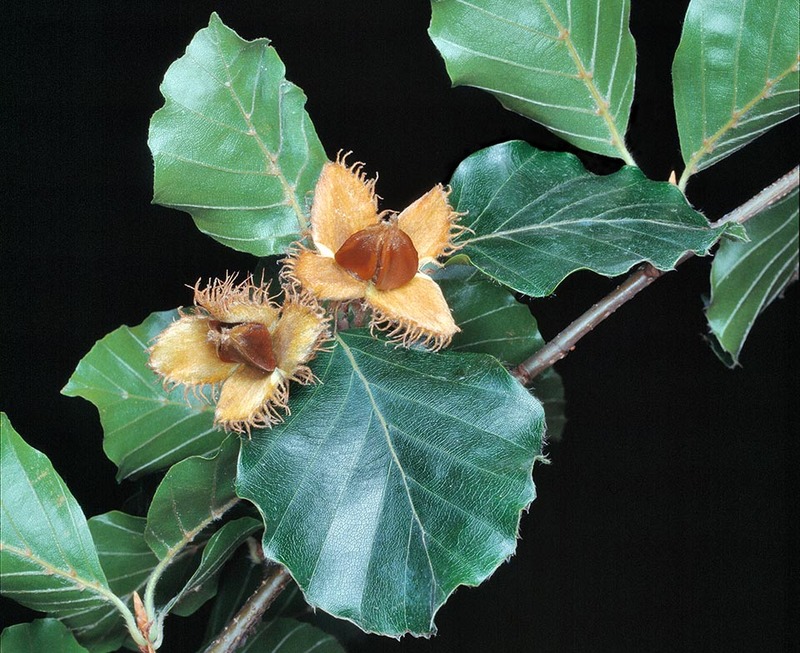 The fruits, commonly known as beechnuts do get ripe by the end of summer (September-October) and have a brown colour. The fructification is erratic but every 4-5 years becomes very abundant (bumper crop). The wood is hard and heavy but easy to work. Since ever, it represents an excellent fuel, as it can be transformed in a much appreciated charcoal. 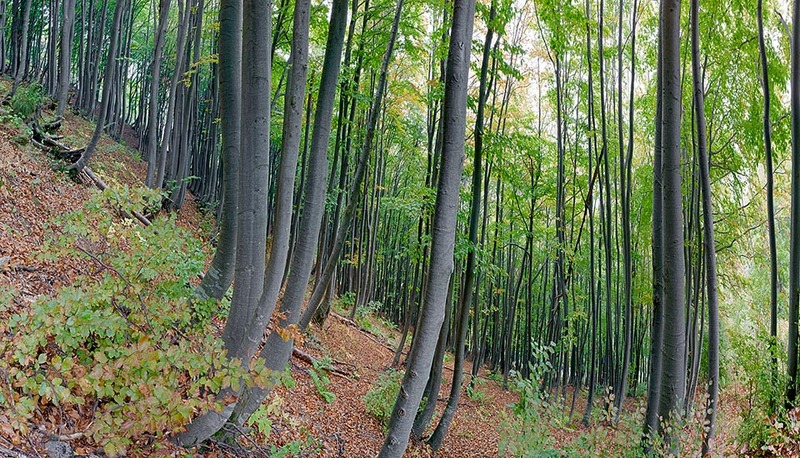 The beechwoods are are managed as coppice as well as high forest, even if the management as coppice is presently in progressive abandonment, with the resulting conversion into high stem. 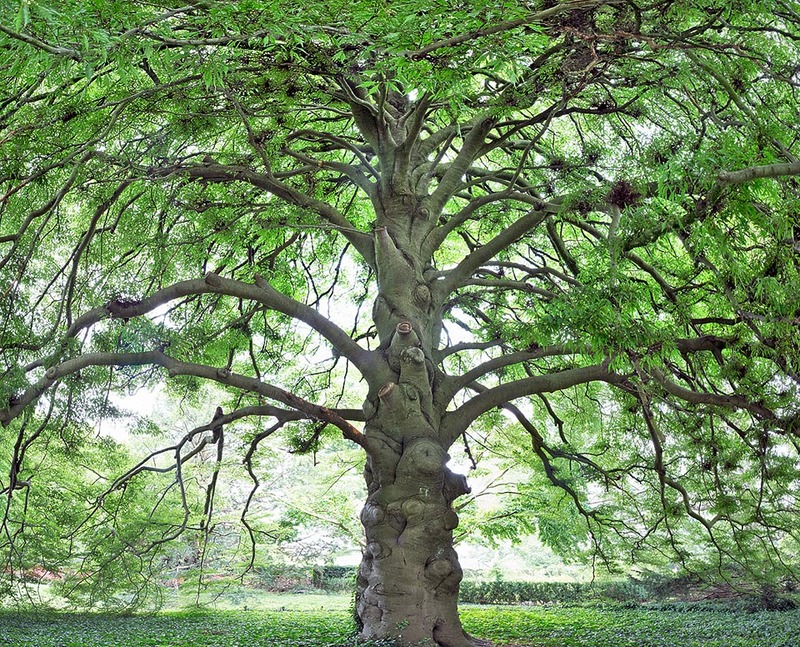 The common beech finds an ample utilization also with ornamental purpose in the creation of parks and gardens. Among the most ornamentally interesting cultivars, great interest has the cv ‘Pendula’ characterized by drooping branches, such to form in the mature specimens domed crowns of great aesthetic effect. No less interesting is the cv ‘Purpurea’ that characterizes due to its reddish colour, even very intense, almost blackish, during the vegetative season. Similar to the previous ones as per posture and colourations of the leaves are the cv ‘Purple Fountain’ and ‘Purpurea Pendula’ that combine in one unique specimen a weeping posture and a valuable purple colouration of the leaves. Always in the cultivars with coloured foliage has a particular importance the common beech called ‘Roseomarginata’, also known as ‘Tricolor’ and ‘Purpurea Tricolor’. In this cultivar of exceptional ornamental value the leaves exhibit a purple colouration of the inner part of the lamina and a marginal area having a pinkish or white cream colouration. Compared to the other cultivars of common beech this selection has a slower growth and requires fresh and partially shaded locations for a best vegetative development. Another cultivar very appreciated is the ‘Asplenifolia’, known for the very engraved margins, clearly different from the usual leaves of the common beech. The colouration of the leaves gets an intense yellow shade duting the autumnal season. Moreover, we must not forget the cv ‘Dawyck’ (known also as ‘Fastigiata’) that has the posture of the typical columnar tree with a height, in the mature specimens, that may even reach the 25 m. In this cultivar they have obtained further selections called ‘Dawyck Gold’ and ‘Dawyck Purple’ that display interesting colourations in yellow and purple red respectively. To remember, finally, the cv ‘Tortuosa’ that has an unusual twisted growth of the ramifications that render these plants very attractive, to utilize in isolated position in the gardens in order to allow their full vision and aesthetic enjoyment. When mature, the appearance is similar to that of a big bonsai. The cultivars selected for the various characteristics of the posture or the foliage are propagated in the nursery environment in late winter by cleft grafting or during the vegetative season by bud grafting or by approach.